Trevor Bayne won the Daytona 500 and shared his faith with the world. This off-season I’ve been reading about two young men who are igniting the sports world with their faith: Tim Tebow and Trevor Bayne. Tebow’s book, Through My Eyes, is a New York Times bestseller. Driven by Faith: The Trevor Bayne Story just released as a juvenile biography for ages 9 and up. Don’t let the fact that it’s a kids’ book deter you - it’s a great read for adult race fans, too. Tebow at the 2010 Daytona races. Even though Tebow excels on the gridiron and Bayne accelerates on the racetrack, I discovered they are alike in lots of ways. The most obvious thing is each is making history in his professional sport. Tebow led the Denver Broncos to a win in a playoff game this year. 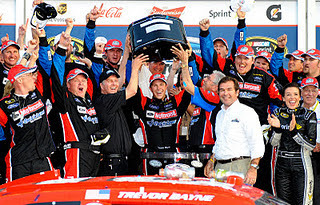 Bayne won the 2011 Daytona 500 in his second career Sprint Cup Series start. Did you know Tebow called Bayne to congratulate him on the Daytona win? Pretty cool, huh. In return, Bayne thinks Tebow is the real deal. While reading the two biographies, I encountered countless other parallels between Tebow and Bayne. Supportive parents who stressed faith in God. The desire to help others, especially children. Maturity beyond their years. A contagious enthusiasm. Success interwoven with difficulty. The desire to win. Humility. They’re celebrities recognized by millions, but what makes Tebow and Bayne tick is the same: Each considers his talent and platform a divine gift and wants to use it for good and to glorify God. Weighty stuff for guys in their early twenties. I’m excited about the influence these two young men wield by letting God work through them. Big projects are already in the works. Tebow is helping build a hospital in the Philippines and Bayne helps kids in Mexico through Back2Back Ministries. I’m praying for Tim and Trevor, asking God to help them stay true to their convictions in the midst of temptations. I hope they score many more wins in football and racing. But my ongoing prayer is that they continue to seek God’s will and touch many lives for Jesus. That’s what I want for my own life, too. How about you? You and I may not be famous athletes, but we have God-given gifts and talents we can use for good. When we bless someone in a tangible way, it opens the door for us to talk about our beliefs. Think about something you really love to do. Then ask God to show you how to use that ability to help others. Let’s join Tim Tebow and Trevor Bayne in sharing our faith. Beth Bence Reinke is the author of Race Fans’ Devotions to Go, a month-long, pocket-sized devotional book for female racing fans. Her column for Skirts and Scuffs explores the role of faith in motorsports. 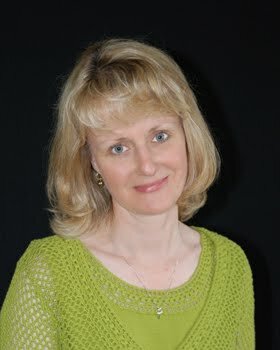 To read more of Beth’s posts, click on her name or “Faith on the Frontstretch” on the Skirts and Scuffs home page. Comment on this post or reach her via twitter: @bbreinke. Great Article! These are both fine young men who set a great example for kids and teens. Can you please ask SPEED Channel to Post the Tim Tebow, Faith intro. they ran today before the Daytona 500? It was amazing and should be seen by more people!